More U.S. cities ban the sale of puppy and kitten mill pets - is your hometown on board? On November 9, the city of Casselberry, Florida, joined a group of cities in that state who, this month, passed laws and enacted restrictions banning the sale of dogs and cats, obtained from puppy and kitten mills, in local pet stores. According to Best Friends, in November, two additional Florida cities, West Melbourne and Deerfield Beach, joined that prestigious list. Casselberry is the first city in Central Florida to pass a partial ban on sales of those animals. The ban will allow independent breeders, such as those who breed and sell animals in their own stores, or on non-retail premises or to other facilities, to continue to operate. However, proper and accurate documentation, or "certificate of source", will need to be provided for those animals. Local pet advocates hope that other Central Florida cities such as Deland, Oviedo, Altamonte Springs and Longwood adopt the idea. If that happens, it might catch on with larger governments like Orlando. 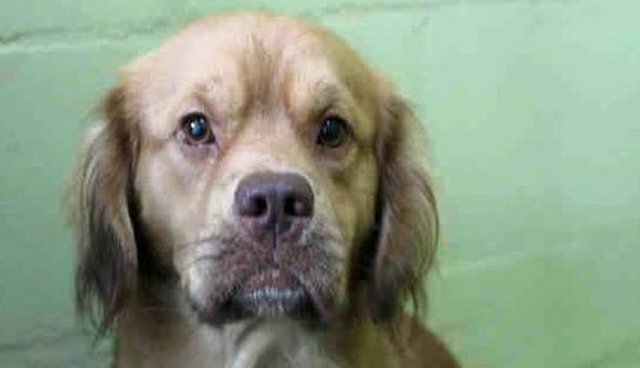 The cities that have banned or partially banned the sales of dogs and cats will still allow pets from shelters and rescues to be marketed to prospective adoptive families. The rescue must be one that is duly registered with the Florida Department of State and the Florida Department of Agriculture and Consumer Services, as applicable, and with the appropriate authority in the jurisdiction in which the not-for-profit legal entity is headquartered. Many Central Florida businesses understand the need for additional exposure for animals from local shelters and rescues. Pookies Pet Nutrition and Bow Wow Bakery holds a "Rescuefest", a huge event for local rescues. 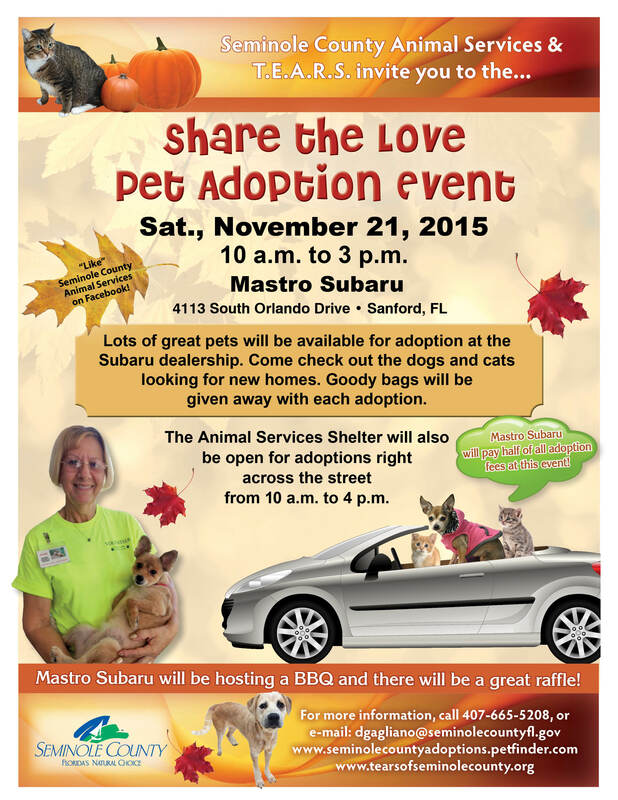 Maestro Subaru, the auto dealership in Sanford, FL, has organized another pet adoption day, scheduled for November 21, to showcase the animals from Seminole County Animal Services. For information on that event, please click here for their flyer. Subaru has been a rescue partner with SCAS for quite some time. Other local Petsmart and Petco's also have rescued animals up for adoption, showcased in each of their stores. T.E.A.R.S. of Seminole County is always looking for volunteers to assist them in these events. You can click here for information. The Reed Nissan auto dealership has also stepped up to the plate, with their Friend In Reedpartnership with the Pet Alliance of Greater Orlando. Their next adoption day with PAGO is scheduled for November 23. Information is available here. Another pet store in the area that has adoptable animals on display is Pet Supermarket. There are many chains across the country that see the need and benefit to the communities they serve to help find homes for animals needing second chances. You can click on this link to find one near you. You can find cats and kittens from Orlando's Orange County Animal Services available for adoption in area pet stores such as Petsmart and Petco as well. Obviously, anything that will bring the adoptable pets to the public, rather than waiting for the public to come to their facility, will increase the possibility of that animal getting a new home. If you would like to add your event to this list, please do so in the comment section following the article! The Casselberry and West Melbourne restrictions are effective immediately. The new restrictions in Deerfield Beach become effective in May, 2016. Casselberry will enact a high fine, in addition to any other penalty, upon a pet store owner who is found to have falsified a "certificate of source." A fine of $250.00 per day per dog and/or cat has been set by that city for any violation. The new restriction are based on recommendations from The Humane Society of the United States, including their findings that, "more than a million dogs and cats in the United States are housed and bred each year at substandard breeding facilities known as "puppy mills" or "kitten factories," ("Facilities") that mass-produce animals for sale to the public. Because of the lack of proper animal husbandry practices at these Facilities, animals born and raised there are more likely to have genetic disorders and lack adequate socialization, and breeding animals utilized there are subject to inhumane housing conditions and are indiscriminately disposed of when they reach the end of their profitable breeding cycle." The Deerfield Beach City Commission's ruling held that puppy mills and kitten factories continue to exist in part because of public demand fueled by the availability of dogs and cats in pet stores leading to "impulse" purchases of animals; and that restricting the retail sale of dogs and cats in the City will promote community awareness of animal welfare and, in turn, will foster a more humane environment in the City. It will also reduce impulse purchases of pets, which can lead to abandonment or mistreatment of the animals once they have outgrown their initial puppy or kitten appeal. Bans such as these "will also encourage pet consumers to adopt dogs and cats from shelters...thereby saving animals' lives and reducing the cost to the public of sheltering animals." Laws restricting the sale of cats and dogs already exist in about 40 local governments in Florida. The Casselberry City Commission voted 4–1 in favor of the agenda item.